For the eleventh consecutive season, Reading United A.C. will participate in the United States Soccer Federation’s Lamar Hunt U.S. Open Cup. With a berth in the 106th edition of the U.S. Open Cup, United extend their record for most consecutive appearances in the competition by an amateur club. In total, Reading has qualified for the competition thirteen times. 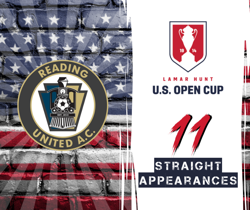 READING, PA (January 31, 2019) - For the eleventh consecutive season, Reading United A.C. will participate in the United States Soccer Federation’s Lamar Hunt U.S. Open Cup. With a berth in the 106th edition of the U.S. Open Cup, United extend their record for most consecutive appearances in the competition by an amateur club. In total, Reading has qualified for the competition thirteen times. Reading United claimed their place in the 2019 U.S. Open Cup by capturing the 2018 Premier Development League Mid-Atlantic Division crown after completing an unbeaten regular season that saw the club win 14 matches. Reading are one of just 10 teams from the re-branded USL League Two to earn a place in this year’s edition of the cup. The 2019 tournament kicks off May 7th and May 8th with 19 First Round matches and features a total of 84 teams from across the United States, culminating in August with America’s soccer champion lifting the Open Cup trophy after eight rounds of single-elimination play. The pairings for the first round of the 2018 U.S. Open Cup will be made by U.S. Soccer on April 10th. The Open Cup is the longest running national soccer competition in the country, having been contested every year since 1914. Clubs from every level of the U.S. Soccer pyramid, from the professional clubs in Major League Soccer to amateur sides in the U.S. Adult Soccer Association compete in the tournament. Clubs from Pennsylvania have won the competition a total of 14 times. Major League Soccer’s Houston Dynamo are the defending champions of the Open Cup. In last season’s Open Cup, Reading United erased a one goal deficit in their first round clash with the visiting Christos FC to force extra time and penalty kicks. Goalkeeper Bennett Strutz made a clutch save while United went a perfect five out of five from the penalty spot to earn a place in the second round. Reading faced professional opposition in the second round when they welcomed the Richmond Kickers to town. United again erased an early deficit and forced the match to penalty kicks, but Richmond escaped with a 4-3 win in the shootout.